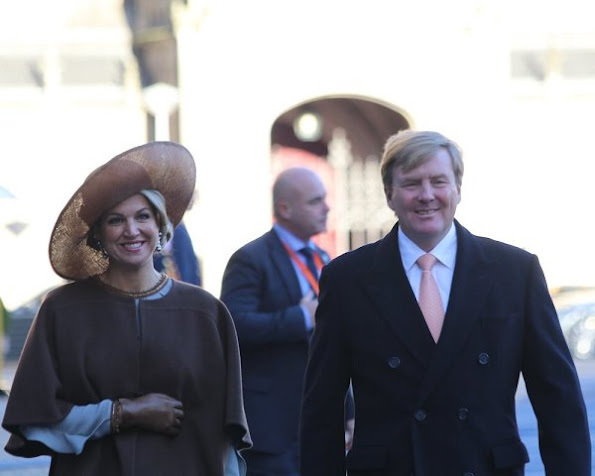 Upon the invitation of King Willem-Alexander and Queen Maxima of Netherlands, King Philippe and Queen Mathilde of Belgium visit The Netherlands. 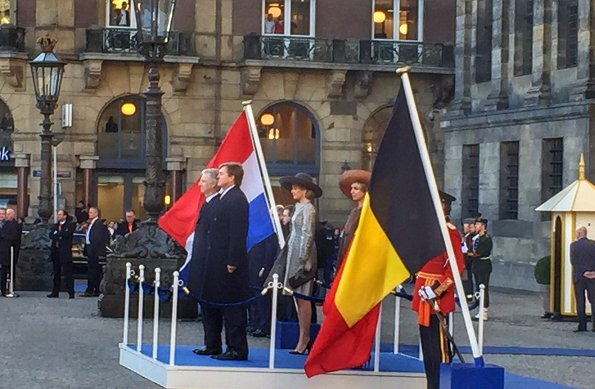 King Philippe and Queen Mathilde officially welcomed by King Willem-Alexander and Queen Máxima at the Dam Square on November 28, 2016 in Amsterdam. According to the programme, the state visit starts on November 28 and ends on November 30, 2016. Both queens are looking good. I wonder if they called each other beforehand to coordinate their outfits. They both have wide-brimmed hats, same color of outfits. 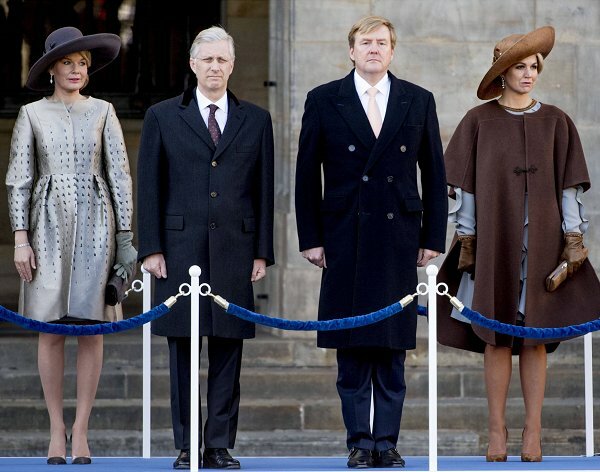 If Queen Maxima hasn't worn a coat they would look very coordinated, color wise. Maxima wouldn't be Maxima without a big hat. Mathilde's hat doesn't really suit her, a smaller version would have been better, methinks. I loved both big hats! Fingers crossed that we see some big guns for their formal dinner. I hope to see both tiaras on Mathilde and a new pairing of jewels from Maxima! I have to give this to Mathilde. This is a surprisigly well executed Natan dress and I like the matching coat too. 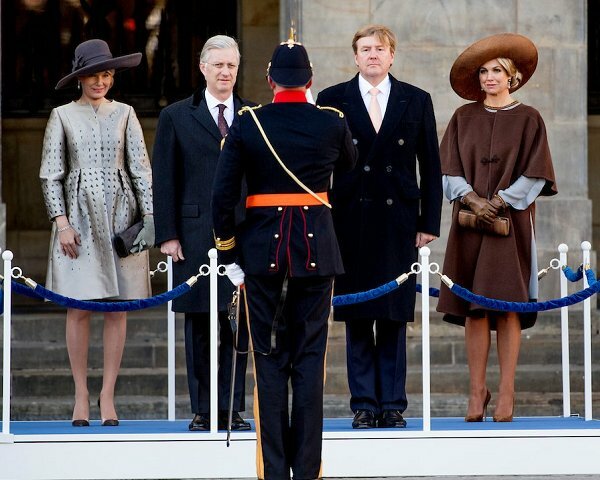 Máxima's ruffles are nice too but I can't warm up to her cape-coat. I couldn't say what my issue is with it, I just don't like it. Maybe the hue of brown? Or too short sleeves? 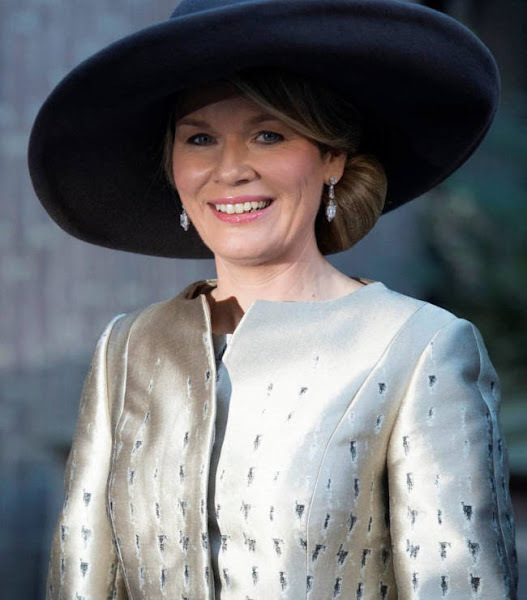 Queen Mathilde looks perfect - I like the whole her look: dress, coat and that big hat. 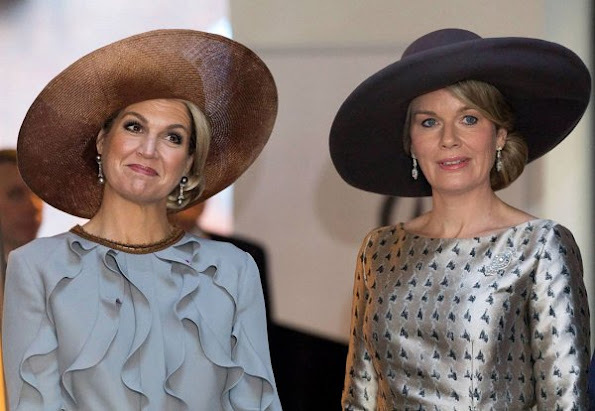 I even think she is wearing it better than Maxima, besides Maxima's hat is transparent and IMO therefore not suitable for this time of year. Nevertheless they are both charming. Lovely! Both queens look spectacular. I love seeing them together as they seem like such a study in contrasts - Queen Mathilde seems very reserved whereas Queen Maxima is so larger than life - but they seem to get along so well. 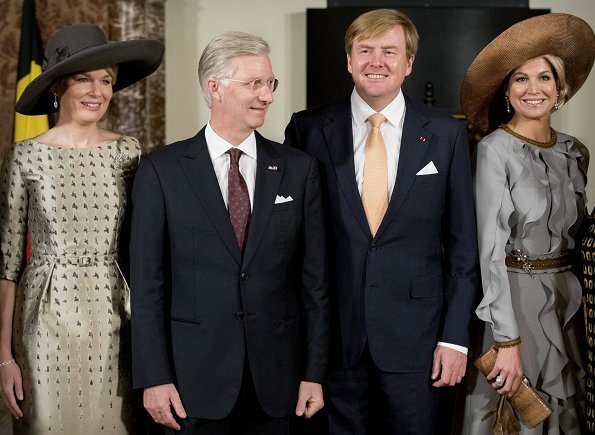 I think both look very elegant and I love the large hat on Mathilde. 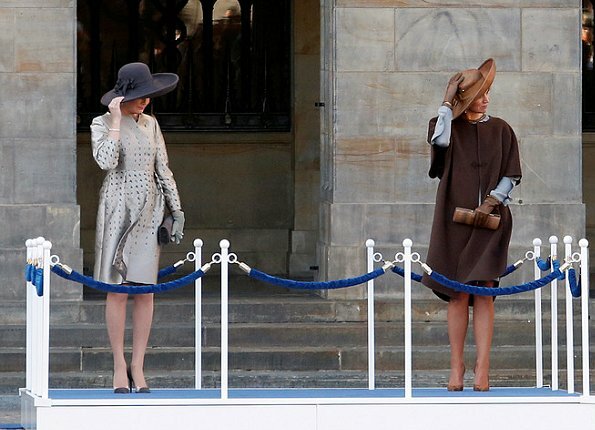 I do agree about Maxima's coat being somehow not right - too casual maybe, and the wrong shade of brown ( the lighter coloured hat matches the dress's trim). Wow! Mathildes dress and coat is a masterpiece of fashion, in design, fabric, colour and tailoring. I don't want to be hypercritical, but the coat should have been one or two centimeters longer in the front part. It is often a problem with Mathildes dresses, they seem to be this tiny bit too short. The accessoires in grey are beautiful, apart from the gloves, which are wrong shade of grey. Would love to see the shoes from close. I agree with some of you, I think the rim of the hat should have been a little smaller. I absolutely love Maximas dress. The combination of grey and brown is superb. As for the cape - well, this is Maxima! Nobody else would wear it, nobody else could wear it. I think it looks best, when she's walking. It underlines her lively appearance. Love Maxima's ensemble, simply perfect... right down to the brooch at her waist. classy, stunning both Queens. Fab demure colors, fabrics and textures.